A new technology, called RFID, promises to change the way we do business, and how we shop and live - but is it hype or for real? Your shopping trolley is heaving, but there are no queues at the checkout and scanning the lot takes only seconds. A new line of clothing is a sell-out success. Instead of waiting weeks for fresh supplies, your logistics manager knows within seconds which warehouse on the route from Thailand to the UK has the clothes in the right colour and size and fast-tracks them through the supply chain. A complex machine refuses to operate. It checked out the worker - he wears the right kind of protective clothing - but also knows he has not completed the training that qualifies him for the job. Every second counts. The nurse tracking down a life-saving heart-lung machine finds it instantly because the equipment broadcasts its exact location. A thief slips five packs of expensive razor blades into his jacket, but the smart shelf knows that an unusually large number of blades has been taken off and alerts security guards. This is not futuristic. Thanks to a new generation of "radio frequency identification" (RFID) tags the last two examples are already on trial, while the others could be reality in three to six years' time. The world's largest retailer, Wal-Mart, has told its top 100 suppliers to get RFID-ready by January 2005 - or lose the business. Experts predict that from 2006 onwards RFID systems will be rolled out on a massive scale and warn that manufacturers, retailers and logistics firms failing to adapt could suffer badly. So is this for real, or will RFID turn out to be yet another investment black hole without real returns? Q&A: What is the RFID hype all about? RFID tags are really just souped-up barcodes that can talk. The tag contains a tiny chip - the size of a full stop on your computer screen - and an antenna to broadcast a unique identifier number. It is then attached to or woven into an asset, for example a pack of batteries, a crate of widgets or a keg of beer. The result: "It's like having an expert with a clipboard sitting next to every of your trucks, manufacturing lines, pallets with goods, and they can tell you at any time what is happening where," says Ken Douglas, global director of technology at oil giant BP. The limits for the technology's application are set by your imagination - and the depth of your pockets. BP uses RFID technology to stop theft at filling stations of a South African logistics company. Fuel pumps work only when a truck with the right tag pulls up close. Thieves can't get a drop. Marks and Spencers is already using an early version of RFID technology to manage effectively its food supply chain. In Germany, retail giant Metro - together with Procter & Gamble and enterprise software firm SAP - has set up a "Future Store", complete with smart shelves and trolleys tracking individual products, and a sophisticated stock control system. If a shelf is close to running out of a certain product, it alerts the stock room to get fresh supplies, to name just one application. Ultimately, though, these are all trials. For starters tags are still relatively expensive. Then there are technical limitations. So-called "passive" tags are small, cheap and fit nicely on things like razor blades, Europe's most-stolen consumer product, but their broadcast range is just a few metres and requires many expensive RFID readers. "Active tags" have a battery and work well in the open, but are bulky and costly. Liquids and metals hinder radio waves. Add crushed tags and faulty readers, and your RFID-based stock flow system throws a wobbly. And do you really need to invest in lots of technology to know exactly which sports shoe sits on which shelf? How much do you want to track? Food multinational Nestle "produces nine billion products every day and we can't tag them all," says the firm's technology manager Paul Roberts. How do you crunch the data broadcast by millions of containers and billions of products, and how do you synchronise multiple massive data bases? Who reaps the benefits, and who bears the costs? The Tescos and Wal-Marts of this world? The manufacturers? The logistics companies? Nobody is sure, and many executives pondering their RFID strategies sound somewhat scared, being aware both of the costs and potential benefits. "At the moment very few people have a good business case for RFID, because they don't know the costs involved, how the technology will develop and the extent of process engineering needed," says John Davison, head of retail research at consulting firm Gartner. If RFID generates only massive costs but doesn't add value, it will disappear, says Martin Swerdlow, chief executive of consulting firm IPI - even though he believes in the ultimate success of the technology. But UK retailers lose £1m worth of roll cages every year, says Paul Richardson of logistics company Exel, which conducts trials with Selfridges and House of Fraser. 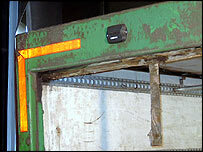 RFID could stop such and other losses. And on high-value items radio tags can create real benefits, says Stuart Facey of Trenstar, which manages most of the UK's beer kegs and uses RFID to keep track of them. "You are not going to solve your problems if you don't know how the information you get is going to help you," says BP's Ken Douglas, who recommends that companies should start with small projects in closed supply chains with clearly defined objectives. 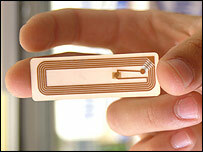 Worryingly, RFID also has the potential to turn into the retail industry's Brent Spar or Frankenfood debacle. Privacy campaigners in the US warn that companies could abuse information gleaned about shopping habits of individual consumers, while others worry about the health implications of all those extra radio transmitters. Despite the hype and worries, RFID is very much in its infancy. After the snazzy powerpoint presentations of some RFID cheerleaders, it comes as a harsh shock to realise that many trials currently conducted in the UK are extremely basic - even though the country is considered to be an RFID technology leader. It took old-style barcodes 25 years to be standardised. 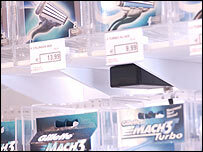 The RFID roll-out will be much faster, with wide agreement on a near-universal standard. "Diktats like that of Wal-Mart are [also] a powerful catalyst for people to look at the business value of RFID applications," says Keith Bell of SAP. And most companies have desperately little visibility of what is happening in their supply chain. Therefore the lure of potential RFID benefits will be so strong that the use of RFID on palettes and crates is nearly inevitable. 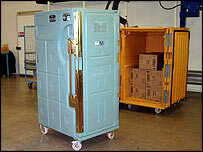 When that happens it will hit suppliers, cargo carriers and retailers regardless of size. The holy grail, though, will be the roll-out of radio tags to individual consumer products. Gartner's John Davison calls it "the endgame where the real benefits are to be had".